Saudi journalist Jamal Khashoggi disappeared after entering the Saudi Arabian consulate in Istanbul on October 2nd. His disappearance was first noted three hours after his entrance to the consulate by his fiancée who was waiting for his return outside. Turkish authorities immediately questioned the Saudi Arabian officials as to what had happened. The Saudi Crown Prince Mohammed Bin Salman (MBS) first claimed that Khashoggi left the consulate minutes to an hour after arriving, not coming to harm within. However, last week the Crown Prince shifted the story stating that Khashoggi died accidentally in a fist fight within the building. At the time of this publishing, MBS has admitted that Khashoggi’s murder had been premeditated. An internal investigation is underway within Saudi Arabia, and 18 officials have reported to have been detained. Still, many questions have been raised as to the sequence of events. Turkish officials claim this was a hit job by Saudi Arabian officials, supporting these accusations with surveillance photos of a 15-member group arriving and leaving from the consulate the same day as Khashoggi. Khashoggi’s body has been missing since the day of his death. On top of that, a key witness from the Saudi consulate left Turkey last week to return to Saudi Arabia. Individuals from Europe and the US have called for international action related to the journalist’s death. 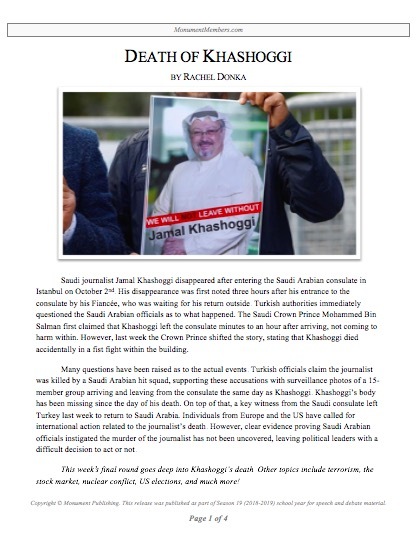 However, clear evidence proving Saudi Arabian officials instigated the murder of the journalist has not been uncovered, leaving political leaders with a difficult decision to act or not. This week’s final round goes deep into Khashoggi’s death. Other topics include terrorism, the stock market, nuclear conflict, US elections, and much more! Rachel Donka competed in NCFCA and Stoa for 6 years. 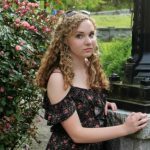 Over the course of her competitive years, she participated in 12 different speech events and three styles of debate, ranking highly on the national level. Her NITOC victories include 1st in Lincoln-Douglas, 2nd in Parli, 3rd in extemp, and 2nd in overall national ranking in 2016.